Students are not only marching, but looking to be active voters for gun control, and that could be what it takes to get past barriers to stricter laws. Students have started something. In Seattle they filled Cal Anderson Park on Saturday with people who rallied for political action against gun violence, then marched to Seattle Center for more speeches. Passionate young people spoke, and the power of their movement drew some prominent state and local elected officials to join them, including U.S. Sen. Maria Cantwell, state Attorney General Bob Ferguson and Gov. Jay Inslee. Teenagers may be the engine that finally moves the nation to substantially reduce gun violence in all of its various forms. 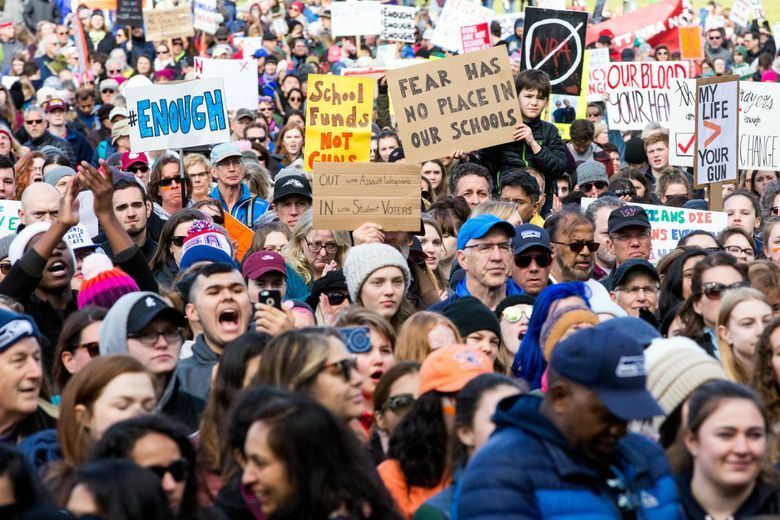 Students walked out of classrooms around the country March 14, and Saturday they upped the ante with a huge March for Our Lives in Washington, D.C., and others in cities throughout the nation. They surged forward in response to the killing of 17 people at Marjory Stoneman Douglas High School in Parkland, Florida, on Feb. 14. That tragedy added to the weight of a long list of other school shootings. Feet on the pavement send a message and energize participants. But persistent political action has to follow, and it seems the students get that. At the Seattle event, as elsewhere, students who’ll be 18 by November’s elections signed up to vote. Parents fought for stricter control of guns after little children were gunned down at Sandy Hook Elementary School in Newtown, Connecticut, in 2012. People have called for change after college-campus shootings and mass shootings in nightclubs and workplaces and public spaces. People have fought for change to stop the steady death toll on city streets, and the violence in homes that is made so easy and so final by the presence of guns. There have been successes, but so many times not, and little has changed at the national level. But this push, led by teenagers, is different. Teens can be impatient and idealistic, though that hasn’t always led them to vote. If it does this time, and if they inspire more adults to vote with gun control in mind, there very well could be change. Most Americans want better control of access to guns. But at the ballot box, guns have usually been a deciding factor mostly for people who oppose any restrictions. 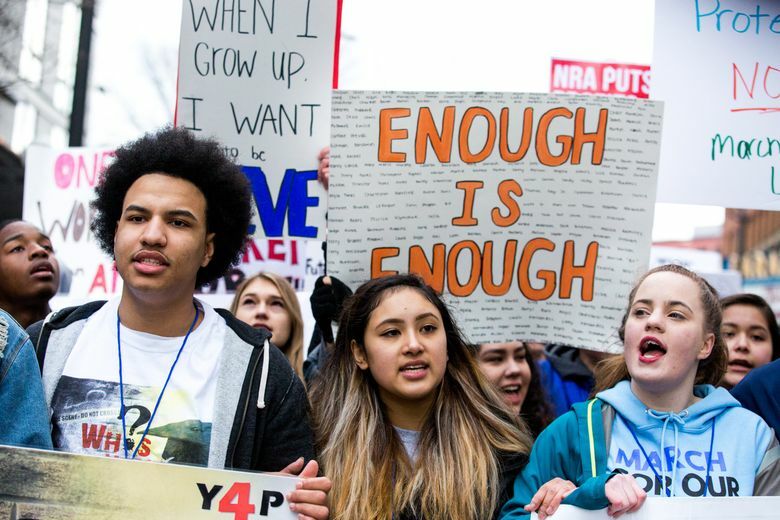 The students are combating the effect of those single-issue voters, by making gun control a deciding factor for candidates who want their vote. The national march’s organizers are asking elected officials to ban the sale of assault-type weapons, ban sale of high-capacity magazines, and close a legal loophole that allows people to buy firearms without a background check. In surveys, most people support those modest steps, but Congress hasn’t adopted them. These students have no patience for inaction, and their leaders are being heard. Cameron Kasky, a student from the high school in Parkland, and one of the organizers of the march, said in an NPR interview Friday that teenagers from “an affluent white community” have a voice that other people affected by gun violence don’t have. People will listen. The media and politicians will pay attention. That attention is good if it leads to a deeper examination of gun violence and to solutions that have an impact on lives beyond those that get the most public attention. Rasaretnam and other speakers here, including several members of Youth 4 Peace, acknowledged the toll of gun violence on communities of color, and the lives lost because of gun suicides. Mass shootings kill hundreds each year, but they are a small portion of gun deaths overall. Thousands die by their own hand each year. Suicide accounts for two-thirds of gun deaths. Controlling assault-style weapons and magazine size won’t make a difference in those deaths. We need to do something about access to handguns, too. Handguns are the weapon of choice in most gun violence, and the use of handguns is a plague on many poorer neighborhoods in cities across the U.S. But mass shootings make a bigger impact on the country. Even mass shootings are not all treated equally in the public discussion of guns, since most instances involve domestic or family shootings. And then there are all the home shootings that involve only one or two people and don’t make big news. One day last week, a 19-year-old man in Brewster, in rural North Central Washington, shot and wounded his mother before fatally shooting himself. The same day, Sunday, a man in Federal Way was arrested in the shooting of his son. The student marchers are giving the rest of us a needed push. We should take advantage of this moment to broaden our understanding of gun violence and to take action. If we don’t, the deaths will keep piling up.